Perfect for passengers who wish to enjoy plenty of Hirosaki city. Enjoy the castle town with an area of one hundred thousand koku spreading from the castle tower in the center, which nearly changes since construction, and Japan’s No.1 apple city Hirosaki. (Important culture property)The third generation feudal lord Nobuyoshi had started construction to provide repose for the people who died in the Tsugaru uniformation regardless of friend and foe. After 11 years of construction it was completed in 1667 by the feudal lord Nobumasa. On the 3rd year of Heisei, after the 9th typhoon (apple typhoon), on the verge of collapse, the whole surface was taken apart for repair. It was the 7th large scale repair after construction. In the 15th year of heisei, after 335 years a service for an enshrined Buddhist image to reveal the principle image was held. 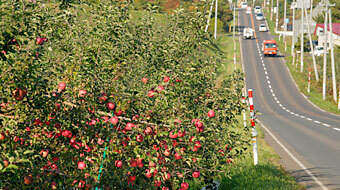 Hirosaki is the center of apple production in Japan, and this is the theme for this park. At the information start up corner “apple house”, you can study about apples while eating and experiencing. There are also souvenir shops which provide more than 1200 items of apple souvenirs. Also, the homestead and farm machines of farmhouses are displayed. You can come into contact with apples, learn, and even play with apples. Every year from 5/7～16, an apple flower festival is held. (Important culture property) After the following year of the construction of Hirosaki castle, the 2nd generation feudal lord, Nobuhira gathered the Zen temples of the Soto sect from the entire Tsugaru to serve as a protective fortress in the back demon’s gate. 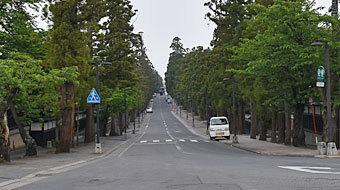 As the 33 temples were lined up as forests, it is called Zen temple area. 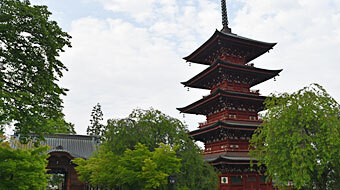 Even throughout Japan, it is rare that temples of the same religious sect are in the same place. (Important culture property) Constructed in 1526. 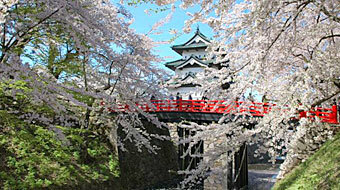 In 1610 as a southwest defense of the Hirosaki castle, it was moved to the current space. 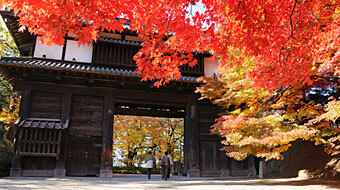 It is a must-see temple where there are graves and mausoleums of the successive liege lords of the Tsugaru family. 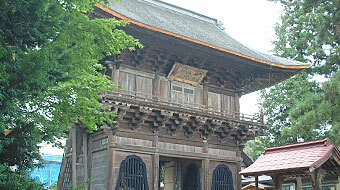 The repair of the Mikagedou and Hondou which started in 2005, after 200 years is finished. Currently, a moiety of the back section is under repair. O-temon square, where both modern and historic western style architectures are built is the strongpoint of sightseeing and culture in Hirosaki. In the back rear of the former local library, 13 houses of mini sized historic structures are displayed which were built in Meiji and Taisho period. In the local literature museum, you can gather information on Hirosaki and the surrounding Tsugaru area, purchase souvenirs, and taste local cuisine. 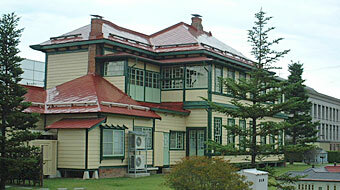 You can also check the vacany of the ryokans (japanese style inn) and hotels. This is a spot you would like to stopover at the beginning of your trip. The castle walls which remain the same as the past history. Inside the park of the area of 42.9 ha (half the size of the Imperial Palace) you can see 2600 sakura trees with 50 sorts, 2200 pine trees, 1200 trees of autumn leaves. One round takes 2 hours, enjoy walking slowly and experience the history. Even after coming many times and at what time, one’s heart flutters to this wonderful place. It is the symbol of Hirosaki. (Important cultural property) The castle which the Tsugaru feudal lords established after the Tsugaru uniformation. The first feudal lord Tamenobu planned the construction and Nobuhira completed the castle in 1611. Remaining on the grounds are the castle tower, three turrets, five gates. In the 22nd year of Heisei, 400 years have passed since construction. In the 23rd year of Heisei, the keep has been moved, and the repair of the stone walls have started. Due to the repair of the stone walls of Hirosaki castle, construction started moving the keep 70m to the inner part. Therefore, the view of the castle is different from the photo. We appreciate your understanding. In the year 2021, the repair of the stone walls is scheduled to end, and the keep will be moved to the former place. Admission paid for the keep and the northern wall. Admission-paid period / April 1 – November 23　9:00～17:00 time required 20 minutes. Admission fee / “indivisual” adults 310 yen, child 100 yen. An important intangible folk cultural asset which colors a summer night in Hirosaki. Starting with Hirosaki Neputa, you can see the folkcraft of Tsugaru, hear a live preformance of Tsugaru Shamisen (3 stringed instrument). 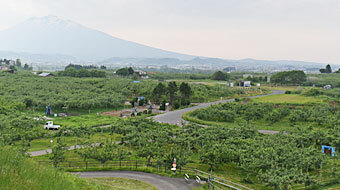 It is a perfect facility where you can see Tsugaru entirely and experience it. There is a corner which introduces Mount Iwaki. 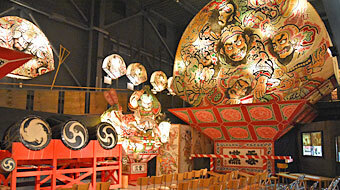 While looking at the 10m high huge Neputa, you can enjoy the taiko (drums) and shishi (lion) live performance, and listen to the Tsugaru shamisen performance up close. Why not experience the Tsugaru culture.